Ordinarily Touch Toggles and our bases manage the position of the each output directly – with one position for green and another for red. Using Touch Toggles with DCC decoders, network, or computer systems is a bit more complicated. Each of these systems can change a control remotely without ever touching the Toggle. It’s important that no matter where the command comes from, the indication on the Touch Toggle needs to show the actual switch position. Our new Translators let the Touch Toggles control inputs to the controlling DCC or computer system, but still show the correct indication. Each touch sends out a brief pushbutton-press, and an “indication” signal back to the Translator tells it which display to show. The Translator DOES NOT understand DCC commands itself. 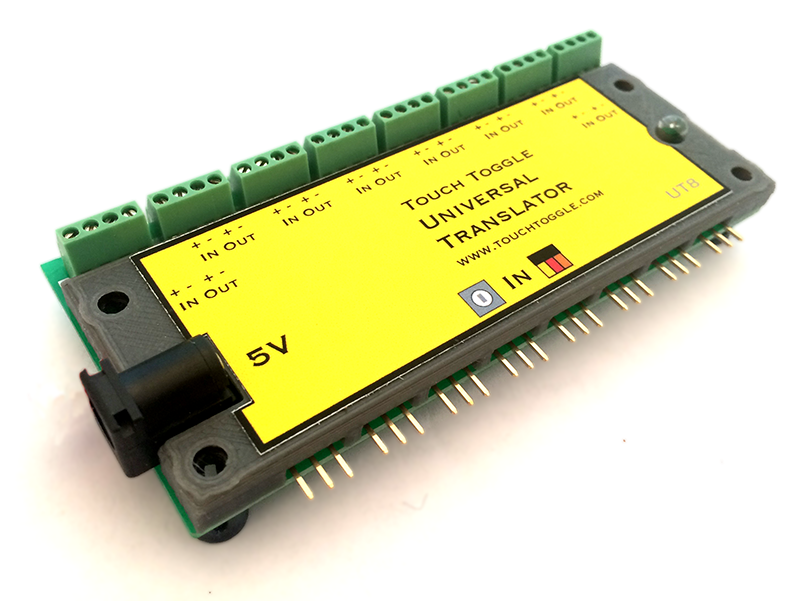 The Universal Translator lets you use Touch Toggles or Mini-Cup Touch Toggles as input to DCC decoders that have local “pushbutton” connections like the popular DS64, Switch8 with Button Board, Switchit, and many others. The Translator can be used to simplify connections to computer and micro controller systems too. It doesn’t matter what signal voltage or polarity you’re “talking”. Each input and output is isolated from all the others – so separate systems, voltages, and power supplies can be connected to each pair. Individual track powered decoders that normally can’t be interconnected will work just as well as larger centralized units. Adjacent Toggles can be connected to ground-common systems like NCE, or positive-common systems like Digitrax. Inputs can be fed 5 to 18 volts (or more) without flinching. The outputs can switch up to +/- 30 volts. Wiring for a single channel of the Universal Translator, Connections to a DCC decoder or computer can be made with light wire. Connecting to a decoder is usually done with phone or ethernet wire. The output pushbutton-press signal connects to the “change switch position” input available on most DCC decoders. The input just needs the same kind of power required to operate a Tortoise or light an LED. This can come from an indication output on the controlling system, reversing DC like is used to operate a Tortoise machine, or DC feedback from relay or switch machine contacts. Digitrax decoders DS64 set up for Tortoise operation and SE8C work right away when wired to the Universal Translator. NCE SwitchIt, Switch8MK2 with Button Board, and Switch Kat will work out of the box too. DCC Specialties Hare, Wabbet, Jack Wabbet and others connect directly. The Team Digital Servette, SMC4, and SMD84 work well (their new SC82 Servo Controller can use our Touch Triggers directly without an interface!) For Team Digital and RR CirKits ribbon cable devices see our new Logic Translator. Obviously, simple decoders that don’t have local or manual control input can’t be directly controlled by the Universal Translator either. Some of these are the original NCE Switch8, AuxBox, LEDcoder, and Digitrax DS52, DS44, and DS51K1. NCE offers a nice workaround for decoders that don’t have pushbutton inputs. The NCE Mini-Panel offers 31 input pushbutton terminals, each that can send up to 4 DCC commands. This can give our Universal Translators a great interface to turnouts all over the layout. Many snap/twin-coil only decoders have no indicator or DC output like the DS64 set up for twin coil operation, the NCE QSnap, and SnapIt. These will need switch-motor contacts or the addition of an Atlas Snap Relay to let the turnout position show on the Toggle. For those of you who are working with direct computer control, DCC networks like RR-Circuits and Team Digital, or micro-controller boards like the Arduino, we offer a Logic Translator. This is a stripped down 5v logic level version of our Universal Translator without all the buffering and isolation. If this sounds like you, please review our Logic Translator. Our Universal Translator requires a plug-in 5v power supply. Universal Translators can be daisy-chained side-by-side to share power, with up to 32 Touch Toggles and 4 Translators in a row, all powered from a single power supply.